You can now increase the redundancy and performance of your AWS Directory Service for Microsoft Active Directory (Enterprise Edition), also known as AWS Microsoft AD, directory by deploying additional domain controllers. Adding domain controllers increases redundancy, resulting in even greater resilience and higher availability. This new capability enables you to have at least two domain controllers operating, even if an Availability Zone were to be temporarily unavailable. The additional domain controllers also improve the performance of your applications by enabling directory clients to load-balance their requests across a larger number of domain controllers. For example, AWS Microsoft AD enables you to use larger fleets of Amazon EC2 instances to run .NET applications that perform frequent user attribute lookups. AWS Microsoft AD is a highly available, managed Active Directory built on actual Microsoft Windows Server 2012 R2 in the AWS Cloud. When you create your AWS Microsoft AD directory, AWS deploys two domain controllers that are exclusively yours in separate Availability Zones for high availability. Now, you can deploy additional domain controllers easily via the Directory Service console or API, by specifying the total number of domain controllers that you want. 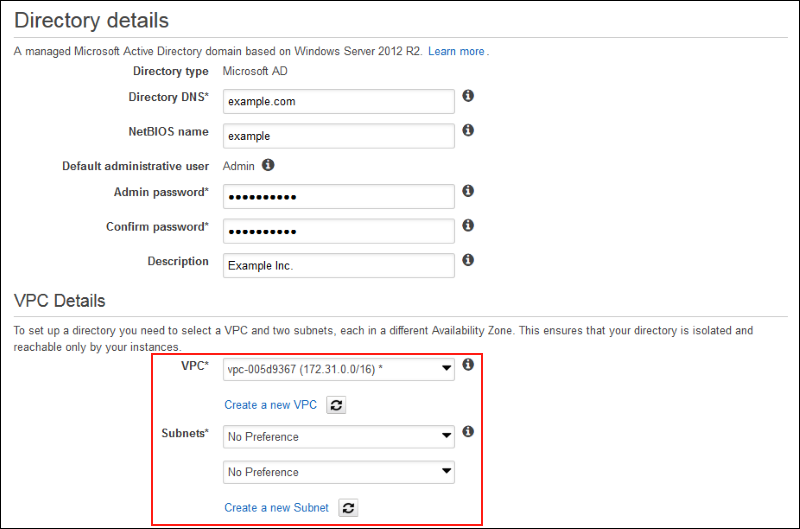 AWS Microsoft AD distributes the additional domain controllers across the Availability Zones and subnets within the Amazon VPC where your directory is running. AWS deploys the domain controllers, configures them to replicate directory changes, monitors for and repairs any issues, performs daily snapshots, and updates the domain controllers with patches. This reduces the effort and complexity of creating and managing your own domain controllers in the AWS Cloud. 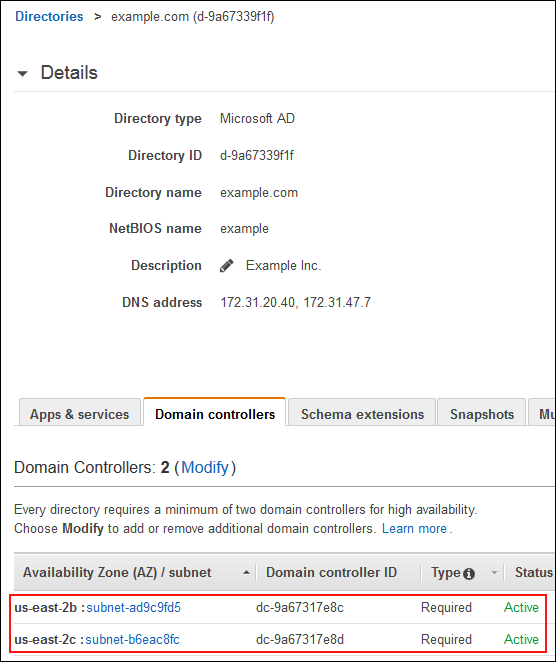 In this blog post, I create an AWS Microsoft AD directory with two domain controllers in each Availability Zone. This ensures that I always have at least two domain controllers operating, even if an entire Availability Zone were to be temporarily unavailable. To accomplish this, first I create an AWS Microsoft AD directory with one domain controller per Availability Zone, and then I deploy one additional domain controller per Availability Zone. The following diagram shows how AWS Microsoft AD deploys all the domain controllers in this solution after you complete Steps 1 and 2. In Step 1, AWS Microsoft AD deploys the two required domain controllers across multiple Availability Zones and subnets in an Amazon VPC. In Step 2, AWS Microsoft AD deploys one additional domain controller per Availability Zone and subnet. First, I create an AWS Microsoft AD directory in an Amazon VPC. 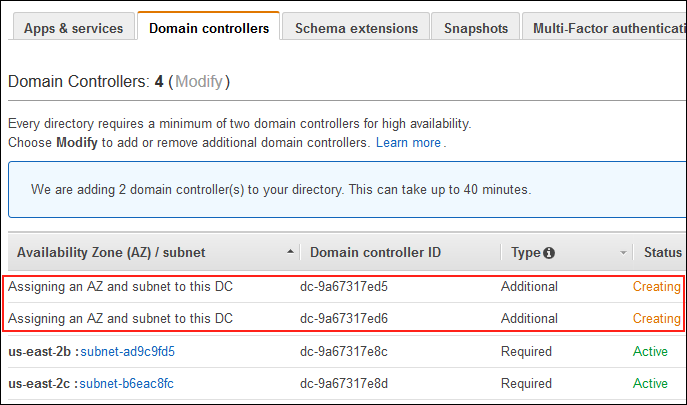 I can add domain controllers only after AWS Microsoft AD configures my first two required domain controllers. In my example, my domain name is example.com. When I create my directory, I must choose the VPC in which to deploy my directory (as shown in the following screenshot). Optionally, I can choose the subnets in which to deploy my domain controllers, and AWS Microsoft AD ensures I select subnets from different Availability Zones. In this case, I have no subnet preference, so I choose No Preference from the Subnets drop-down list. In this configuration, AWS Microsoft AD selects subnets from two different Availability Zones to deploy the directory. I then choose Next Step to review my configuration, and then choose Create Microsoft AD. It takes approximately 40 minutes for my domain controllers to be created. I can check the status from the AWS Directory Service console, and when the status is Active, I can add my two additional domain controllers to the directory. Now that I have created an AWS Microsoft AD directory and it is active, I can deploy two additional domain controllers in the directory. AWS Microsoft AD enables me to add domain controllers through the Directory Service console or API. In this post, I use the console. I open the AWS Management Console, choose Directory Service, and then choose the Microsoft AD Directory ID. In my example, my recently created directory is example.com, as shown in the following screenshot. I choose the Domain controllers tab next. Here I can see the two domain controllers that AWS Microsoft AD created for me in Step 1. It also shows the Availability Zones and subnets in which AWS Microsoft AD deployed the domain controllers. I then choose Modify on the Domain controllers tab. I specify the total number of domain controllers I want by choosing the subtract and add buttons. In my example, I want four domain controllers in total for my directory. I choose Apply. 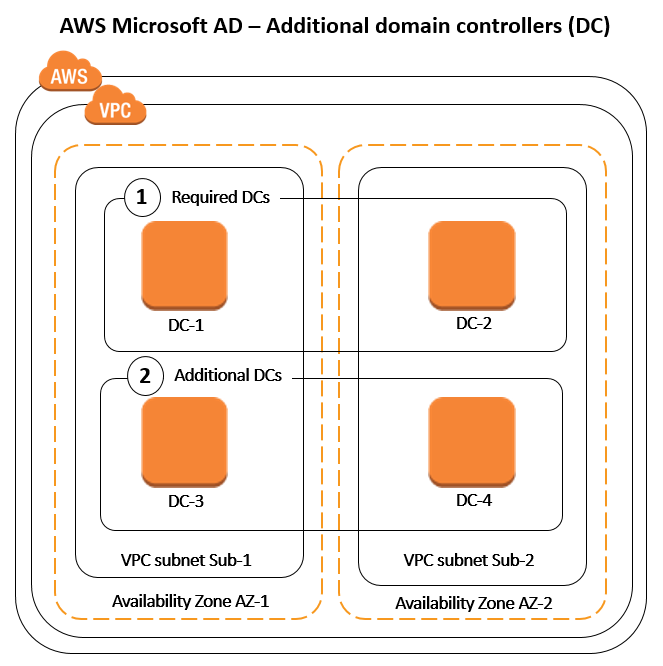 AWS Microsoft AD deploys the two additional domain controllers and distributes them evenly across the Availability Zones and subnets in my Amazon VPC. Within a few seconds, I can see the Availability Zones and subnets in which AWS Microsoft AD deployed my two additional domain controllers with a status of Creating (see the following screenshot). While AWS Microsoft AD deploys the additional domain controllers, my directory continues to operate by using the active domain controllers—with no disruption of service. When AWS Microsoft AD completes the deployment steps, all domain controllers are in Active status and available for use by my applications. As a result, I have improved the redundancy and performance of my directory. Note: After deploying additional domain controllers, I can reduce the number of domain controllers by repeating the modification steps with a lower number of total domain controllers. Unless a directory is deleted, AWS Microsoft AD does not allow fewer than two domain controllers per directory in order to deliver fault tolerance and high availability. 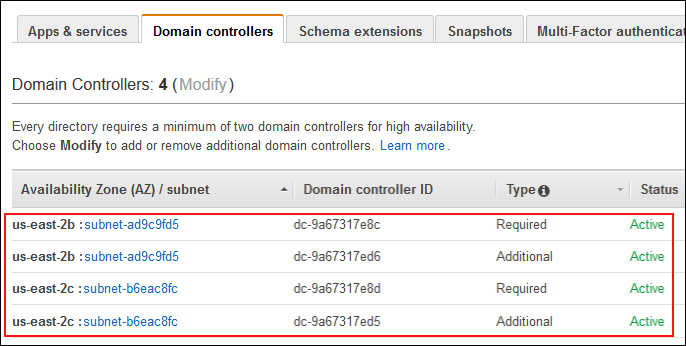 In this blog post, I demonstrated how to deploy additional domain controllers in your AWS Microsoft AD directory. By adding domain controllers, you increase the redundancy and performance of your directory, which makes it easier for you to migrate and run mission-critical Active Directory–integrated workloads in the AWS Cloud without having to deploy and maintain your own AD infrastructure. To learn more about AWS Directory Service, see the AWS Directory Service home page. If you have questions, post them on the Directory Service forum.